Dimensions to suit ANSI Standard Flanges. Note: If inner guide rings are required for Table S and T flanges then special dimensions are required. Metallic ring joint gaskets are heavy duty, high-pressure gaskets largely used in offshore petrochemical applications. They are precision-engineered components designed to be used in conjunction with precisionmachined flanges. All our Ring Joints are manufactured according to ASME B16.20. The gasket material is selected on a number of grounds; primarily chemical compatibility with the media and the hardness of the flange. 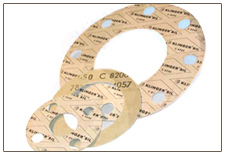 The gasket material ideally needs to be roughly 30 Brinell less than the flange material to ensure sufficient deformation of the gasket without damaging the flange facng. • Used for high pressure applications. • High integrity seal at high pressures. • Suitable for flat and round bottom groove flanges. • Suitable for flat bottom groove flanges. Manufactured to ASME B16 20 Also available in a range of alloys shown on page 80. Manufactured to ASME B16 20. 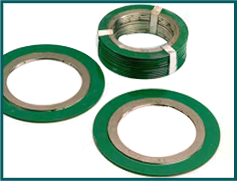 • Used for high pressure API applications. 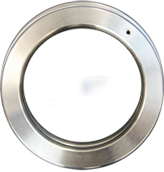 • Pressure energised design improves efficiency of seal with increasing internal pressure. • Suitable for API 6BX flanges. • PTFE coating improves corrosion resistance and provides easy identification. • Designed to create a high integrity joint with primary and secondary seals. Also available in a range of alloys: Low Carbon Steel Duplex 17/4-PH Inconel 625.